Published on Tuesday 7. October, 2008 in Kirks and Uncategorized. 0 Comments Tags: Seegräben, Sonja, Volker. When fall is coming and the sun shine drops out – these are some of the nicest days in the year. 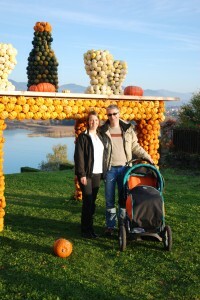 We enjoyed the time with our friends at a nice place at the lake of Pfäffikon on Halloween. You are currently browsing the The world & us weblog archives for the month October, 2008.